Low-calorie sweeteners (LCS) offer a palatable alternative to caloric sugars such as sucrose (table sugar) and high fructose corn syrup and are commonly found in soft drinks, sweetener packets, grains, snack foods, dairy products, hygiene products, and medications. Low calorie sweeteners are some of the most thoroughly tested and evaluated of all food additives. Products including aspartame and saccharin have undergone several rounds of risk assessment by the United States Food and Drug Administration (FDA) and the European Food Safety Authority (EFSA), in relation to a number of potential safety concerns, including carcinogenicity and more recently, effects on body weight gain, glycemic control and effects on the gut microbiome. Based on existing evidence, LCS can be a useful tool for people actively engaged in managing their body weight for weight loss and maintenance. Low-calorie sweeteners (LCS) are commonly-used substitutes for caloric sugars such as high-fructose corn syrup, yet their role in weight management and health remains a topic of continued controversy . The role of LCS in a healthful diet has been contentious for over 135 years. Controversy arose with the discovery itself of the first LCS, saccharin, and has been ongoing for issues related to the safety of LCS and their efficacy for weight management. Saccharin was discovered initially by the chemist Ira Remsen in 1878 at Johns Hopkins University. However, it was accidentally re-discovered in 1879 by his post-doctoral student, Constantine Fahlberg, while working on derivatives of coal tar products. Fahlberg's origin is itself less than clear, being referenced as American , Russian  and German-American  in different sources. The unsettled questions prompted considerable new research through the 1990s and early 2000s. Most of the work entailed preload design trials to assess the effects of LCS on appetite  and short-term trials to measure effects on food intake . A clear evolution of thinking is apparent from the conclusions of reviews on the topics by researchers in the field at the time. These are summarized in Tables 1 and 2 for appetite and food intake outcome, respectively. Both reveal an early view that LCS were potentially counter-productive for weight loss because they could stimulate appetite and food intake. All studies including a comparison between different sweetness levels (same caloric value - the addition principle) have revealed a stimulatory effect of sweetness on hunger and/or food intake . A review of published data shows that although intense sweeteners have been shown to increase hunger ratings in some studies in humans, this has not been a consistent and reproducible observation . Artificial sweeteners do not increase energy intake or ratings of hunger . No stimulation of appetite was observed following the consumption of intense sweeteners in such foods as . Reports of a small increase in subjective appetite when aspartame is added to water have come from two laboratories 15 and 16. This small transient effect seems specific to the addition of aspartame to water and has not been found in studies utilizing familiar beverages. Table 1: Effects of low calorie sweeteners on appetite. Any slight effect on perceived hunger has not been translated into an increase in food ingestion. Artificial sweeteners do not increase energy intake or ratings of hunger. Most studies that have measured food intakes following ingestion of aspartame-sweetened preloads, as compared to sucrose, reported no significant effects. Table 2: Effects of low calorie sweeteners on energy intake. The sweetening intensities of the products range from 30 up to 20,000 times the potency of sugar for cyclamate and advantame (the latest United States (US) Food and Drug Administration (FDA) approved sweetener), respectively. When blended together low calorie sweeteners can have synergetic qualities in terms of sweetness potency, sensory characteristics, and an increased shelf life, with the classic sweetener blends being saccharin and cyclamate (1:10 ratio) and aspartame and acesulfame-potassium . The sweetener of choice for many years was the cyclamate/saccharin combination. This was until concerns arose regarding the potential to cause bladder carcinogenicity within rodent toxicology studies, and the discovery that cyclamate was also metabolized to cyclohexylamine with toxic potential. Given this, the FDA chose to remove its Generally Recognized as Safe (GRAS) status in 1969 and to totally ban cyclamate in 1970 . Even though the conduct of subsequent studies has proven that cyclamate is not a carcinogen, the ban on cyclamate remains in place in the US today, although it is approved for use internationally with the exception of a few countries including Japan . In contrast, in 1977 US Congress placed a moratorium on a ban of the use of saccharin, while additional studies were conducted. The law also required that products containing saccharin contain a label warning that the “Use of this product may be hazardous to your health. This product contains saccharin which has been determined to cause cancer in laboratory animals”. The saccharin warning was subsequently removed in December 2000 . Although the members of this group of materials all impart sweetness, they show differences in properties such as potency, mouth feel, duration of sweetness, aftertaste and stability, and are all structurally different. The differences in the structures of the molecules are clearly outlined in Figure 1 . 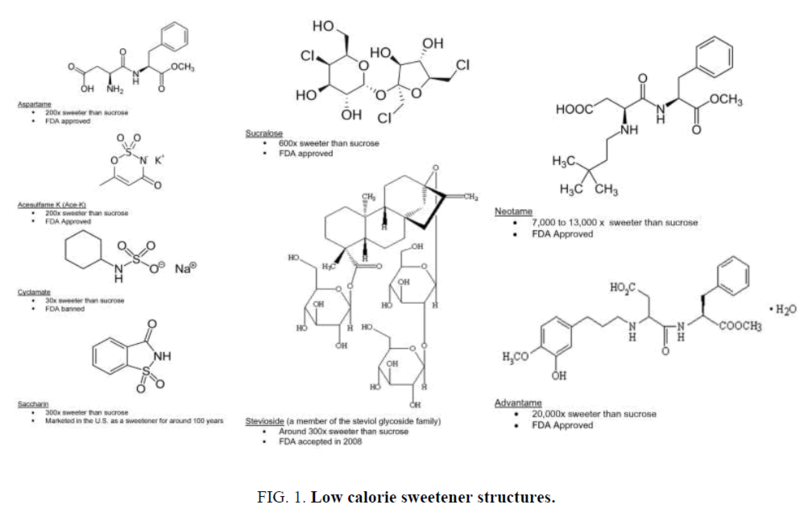 Figure 1: Low calorie sweetener structures. LCS are a class of highly sweet compounds which contribute no or few calories . As such, they are commonly used in foods and beverages to lower calorie content while maintaining palatability . LCS are also referred to as artificial sweeteners, nonnutritive sweeteners, high-intensity sweeteners, and non-caloric sweeteners. There are six LCS approved for use as food additives by the US Food and Drug Administration (FDA) . These include acesulfame-potassium, aspartame, advantame, neotame, saccharin, and sucralose. In addition, stevioside and rebausioside A (both sweet extracts of the Stevia rebaudiana Bertoni plant) as well as luo han guo (monkfruit) are considered generally recognized as safe (GRAS), meaning that expert consensus has been reached in order to determine that the food additive is be safe for its intended use . The GRAS process differs from that of food additive approval, as safety data for food additives, are submitted to the FDA for review to determine whether the substance is safe, prior to arriving on the market . Other LCS, including alitame and cyclamates, are not approved for use in the US but are approved and commonly used in many other parts of the world . Sugar alcohols and other sugar substitutes, such as high fructose corn syrup are not included in this review, as they contain calories and are therefore not LCS. Evidence from large epidemiological studies and randomized trials has implicated excessive sugar consumption to adverse health consequences, prompting leading healthcare professionals to recommend population-wide reductions in the intake of refined sugars . The substitution of caloric sugars for low calorie sweeteners (LCS) (also referred to as non-nutritive sweeteners or artificial sweeteners) in foods and beverages is one approach to promote adherence to these recommendations. LCS are highly potent sugar substitutes that permit reductions in the energy density of foods and beverages, while maintaining high palatability. There is, however, a great deal of controversy regarding the health consequences of LCS consumption, with conflicting studies suggesting beneficial , harmful  or trivial  outcomes. These controversies have resulted in major misunderstandings amongst the public regarding the use of LCS in foodstuffs. Cyclamate and saccharin are the least expensive LCS and comprise the majority of LCS consumption worldwide . Because cyclamate is only 30 times sweeter than sucrose by weight, compared to approximately 200 times, 300 times, 600 times for aspartame and acesulfame-potassium, saccharin, and sucralose, respectively , cyclamate leads the LCS market only when consumption is calculated by volume . In addition, as mentioned above, cyclamate is not FDA approved. In contrast, saccharin is the worldwide market leader based on sucrose equivalents and has a particularly strong presence in the tabletop packet market, primarily as Sweet ‘N’ Low™ . As consumer preferences continue to shift toward natural products, the global consumption of stevioside and rebaudioside A, is expected to increase more rapidly than other LCS . In addition to its appeal as a natural LCS, rebaudioside A is also perceived as being more palatable than other LCS  and food and beverage manufacturers are therefore expected to expand the incorporation of stevioside and rebaudioside A in newly formulated products . As mentioned previously the use of observational studies to support cause and effect conclusions is considerably strengthened by direct evidence of plausible biological mechanism(s) substantiating the potential for a given exposure to affect weight, weight gain or BMI. Mattes and Popkin  published a comprehensive review of the potential mechanisms by which LCS might affect appetite and food intake as well as other elements of energy balance and hence bodyweight. From their review of existing literature, they concluded that there was no evidence for LCS affecting body weight by a mechanism aside from affecting energy and macronutrient intakes which would mediate other outcome variables. A number of other mechanisms have been considered, including the potential for LCS to stimulate sweet receptors in the gut, which in animal models can affect gut hormone release and intestinal glucose uptake . One of the most compelling mechanisms proposed is disruption of associative learning ; however, such a mechanism has not yet been demonstrated in humans . Mattes and Popkin  concluded in their review that existing evidence in humans does not support the various mechanisms that have been proposed for how LCS might affect energy balance. Suez et al. , showed by supplementing the drinking water of mice with high doses of commercial formulations of saccharin, sucralose or aspartame. Surprisingly, after 11 weeks of exposure, each of the NAS consuming mouse groups independently displayed marked glucose intolerance as compared to various controls, including water, sucrose or glucose consuming mice. The latter control was especially important, as most commercial powdered NAS formulation involve a mixture of small amounts of NAS mixed into a larger amount of caloric sugar. Indeed, as also shown in Figure 2  from one of their repetitions, in which each of the commercial NAS was compared to a glucose control, enhanced glucose intolerance in mice drinking either saccharin, sucralose or aspartame was noted as early as 8 weeks following initiation of NAS consumption and culminating after 11 weeks of exposure. This phenotype seemed to be microbiome- related, as 2 different antibiotics regimens, targeting Gram-positive or Gram-negative bacteria, abrogated the NAS-induced glucose intolerance. To further study the possible NAS effects on the microbiome, we focused on saccharin. To determine whether the effects noted with commercial saccharin can be shown for its pure form and at varying dietary conditions, we fed mice with a high-fat diet (HFD, 60% kcal from fat) and supplemented their drinking water with the same commercial saccharin regimen given to lean mice, or pure saccharin at an ADI matched dose. Indeed, we determined that saccharin, at all of these conditions, including different diets, lower doses and purified form, could exacerbate glucose intolerance. Furthermore, as with NAS consumed in lean mice, antibiotic treatment ameliorated the exacerbated glucose intolerance induced in obese mice by either pure or commercial saccharin . Figure 2: Impaired glycemic response in NAS consuming mice. 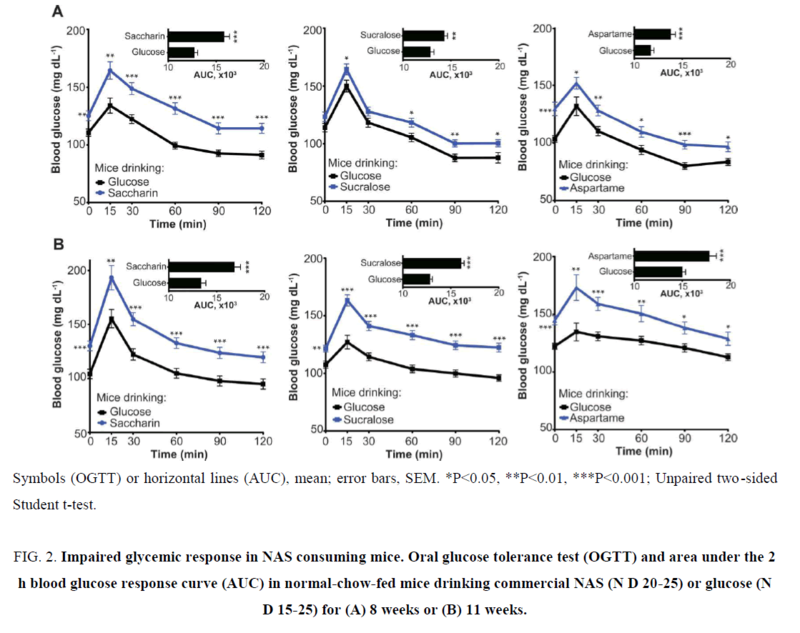 Oral glucose tolerance test (OGTT) and area under the 2 h blood glucose response curve (AUC) in normal-chow-fed mice drinking commercial NAS (N D 20-25) or glucose (N D 15-25) for (A) 8 weeks or (B) 11 weeks. When examining studies of LCS and body weight or other related measures it is useful to account for the context in which those studies are done and what would be the expectations for effects on bodyweight considering the larger body of literature on body weight regulation. Under what conditions would LCS be expected to impact body weight? Clearly, in order for weight loss to occur, an individual must be in a state of negative energy balance in which energy expenditure is greater than energy intake. Thus, it might be expected that experimental conditions in which LCS products are substituted for their full calorie counterparts (e.g., swapping regular soda for diet soda) might be expected to create a net caloric deficit and negative energy balance for some period of time (until the body adapts and a new steady state of energy balance is reached). Conditions in which LCS are added to the diet without removing some other calorie source would not be expected to create negative energy balance and hence, weight loss would not occur (e.g., a person who wasn’t drinking a sugar-sweetened beverage adopts diet beverages thinking they get “free” sweetness without the consequences). Recent trends in LCS usage suggest they are mostly added to the diet vs. substituted for caloric sweeteners . Finally, the intentions, level of effort, beliefs and expectations of an individual may affect the outcome, as significant weight loss rarely happens in the absence of intention and cognitive effort. It may have appeared that some resolution on the efficacy of LCS for weight management was emerging, but this was not the case. Advances in understanding of human physiology and research capabilities raised new questions. Neural imaging technologies permitted monitoring of brain activity in response to oral exposure and ingestion of LCS. Though not uniformly observed , differential responses to LCS and natural sugars in brain reward centers  raised new questions about their behavioral and biological effects. Sweet receptors, labeled such because they were first identified in the oral cavity, were discovered throughout the GI tract and in the periphery . Their presence on intestinal enteroendocrine cells and evidence that LCS may elicit the release of gut peptides  and alter glucose transport in cell culture studies  suggested LCS were not as metabolically inert as previously believed. Greater awareness of the importance of the microbiota in GI function and overall health also prompted new questions as early trials suggested LCS altered bacterial populations and possibly glycemic responses . Adding to this, meta-analyses yielded conflicting outcomes with prospective cohort trials suggesting LCS use was associated with higher BMI while randomized controlled trials showed the opposite . Thomas et al. , this study provides evidence that some individuals can successfully maintain substantial weight losses over a long-term follow-up, despite environmental and physiological challenges that they may face, and emphasizes the importance of maintaining key behavior changes to maintain weight losses long-term and prevent risk of disease. Mean weight loss was 31.3 kg (95% CI=30.8, 31.9) at baseline, 23.8 kg (95% CI=23.2, 24.4) at 5 years and 23.1 ± 0.4 kg (95% CI=22.3, 23.9) at 10 years. More than 87% of participants were estimated to be still maintaining at least a 10% weight loss at years 5 and 10. Larger initial weight losses and longer duration of maintenance were associated with better long-term outcomes. Decreases in leisure-time physical activity, dietary restraint, and frequency of self-weighing and increases in percentage of energy intake from fat and disinhibition were associated with greater weight regain. The majority of weight lost by NWCR members is maintained over 10 years. Long term weight-loss maintenance is possible and requires sustained behavior change . Phelan et al. , These findings suggests that weight loss maintainer (WLM) use more dietary strategies to accomplish their weight loss maintenance, including greater restriction of fat intake, use of fat- and sugar-modified foods, reduced consumption of sugar-sweetened beverages, and increased consumption of artificially sweetened beverages. Ways to promote the use of fat-modified foods and artificial sweeteners merits further research in both prevention and treatment controlled trials . Catenacci et al. , the aim of this cross-sectional study was to evaluate prevalence of and strategies behind low/no calorie sweetened beverage (LNCSB) consumption in successful weight loss maintainers. Regular consumption of LNCSB is common in successful weight loss maintainers for various reasons including helping individuals to limit total energy intake. Changing beverage consumption patterns was felt to be very important for weight loss and maintenance by a substantial percentage of successful weight loss maintainers in the NWCR. Subjects successful at weight loss maintenance primarily consume reduced calorie or non-caloric beverages (including LNCSB) and report low consumption of SSB. The majority (78%) of subjects who consume LNCSB felt that they helped them control or reduce their total food or calorie intake suggesting that these beverages could play a role in a weight control program. Changes in patterns of beverage consumption (specifically increasing water and to a lesser extent, reducing regular calorie/nondiet beverages) may also be important strategies for weight loss and maintenance . While only limited data is available, existing studies suggest that LCS consumption is common worldwide. According to estimates from a representative sample of the German population in 1988, approximately 36% of participants reported consuming LCS , which is similar to estimates reported in the United States . Current consumption in Germany is likely higher than what was reported above, as this estimate was generated prior to the approval of aspartame as a general purpose sweetener and before newer LCS including acesulfame-potassium and sucralose became available. Though also not designed to evaluate temporal trends in LCS consumption, recent data from Western Australia estimate that 37.4% of the general adult population (age 16 years and older) consume diet soft drinks on a weekly basis  and is also consistent with US data . Particularly high LCS consumption has been reported in Central and South America [44,45]. A recent study in Latin American college students reported that 80% of those surveyed reported weekly consumption of LCS, with the highest consumption reported among students in Chile . Among 10- to 16-year-old students in two Chilean cities, 96.6% reported daily LCS consumption . In contrast, consumption of low-calorie (LCS-containing) drinks was reported to be only 8.3% among both children and adults in Mexico between 1999 and 2010 using dietary recall data from the Mexican Nutrition Survey 1999 (n=6049) and the National Health and Nutrition Survey 2012 (n=10.343) . Reasons underlying these discrepant findings have yet to be elucidated. Since the 1970s, when experimental studies on animals reported an excess risk of bladder cancer in rodents treated with extremely high doses of saccharin , a potential role of low-calorie sweeteners in cancer risk has been widely debated. A few epidemiological studies also found some relationships between saccharin and bladder cancer risk in humans , but most - and the largest - studies found no association . Moreover, the carcinogenic effect of saccharin is species-specific, i.e., it is specific to (male) rats administered high doses of sodium saccharin, following the formation of amorphous precipitates in (male) rat urine . Therefore, the role of saccharin in bladder cancer risk is not considered in the present report. With reference to aspartame and other low-calorie sweeteners, most animal studies have failed to show a carcinogenic activity . Only two experimental studies on rats treated with variable doses of aspartame and followed until natural death found an excess incidence of malignant neoplasms, including in particular lymphomas and leukemia in females, but not in males . As discussed earlier, such an apparent excess can be explained by the longer duration of study, as well as by the higher rates of infections of the study animals. A subsequent long-term carcinogenicity study on mice from the same group with transplacental exposure to aspartame found an increased incidence of hepatocellular carcinomas and alveolar/bronchiolar carcinomas in males only . The desire for sweet taste is inborn. Since the ingestion of sugar increases caloric intake and can lead to obesity, a risk factor for some chronic diseases, this common sweetener has to be restricted in the diet of diabetics. The availability of natural and artificial intense sweeteners has made it possible to offer consumers sweet taste without the calories that a diet high in sucrose implies. Since food intake is normally controlled by energy needs, the possibility exists that the use of low-calorie sweeteners may lead to increased food consumption to compensate for sugar calories. Indeed, some investigators have reported that artificial sweeteners, especially saccharin and acesulfame potassium, induce an increase in insulin secretion and a rise in appetite. Aspartame and saccharin were found to produce a significant increase in hunger and appetite 30 min to 60 min after ingestion, while glucose produced a suppression in food consumption. There is a need for extensive research to determine the long-term effects of natural and synthetic intense sweeteners on appetite, weight gain, blood glucose, and insulin levels in normal, obese, and diabetic individuals. Swithers SE. Artificial sweeteners produce the counterintuitive effect of inducing metabolic derangements. Trends Endocrinol Metab. 2013;24(9):431-41. MillerSA, FrattaliVP. Saccharin. In: KretchmerN, HollenbeckCB, editors. Sugarsand sweeteners. Florida: CRC Press; 1991. p. 245-255. Mattes RD. Low calorie sweeteners: Science and controversy Conference proceedings. Physiol Behav. 2016. Rogers P, Blundell J. Evaluation of the influence of intense sweeteners on the short-term control of appetite and caloric intake: a psychobiological approach. In: Grenby T, editor. Progress in Sweeteners, New York: Elsevier Applied Science; 1989. Renwick AG. Intense sweeteners, food intake, and the weight of a body of evidence. Physiol Behav. 1994;55:139-43. Benton D. Can artificial sweeteners help control body weight and prevent obesity? Nutr Res Rev. 2005;18:63-76. Anderson GH, Leiter LA. Sweeteners and food intake: relevance to obesity. In: Angel A, Anderson H, Bouchard C, et al,editors.Progress in obesity research.New York: John Libbey & CompanyLtd. ; 1996. Grenby TH. Advances in Sweeteners. London: Blackie Academic and Professional; 1996. Chedd G. The search for sweetness. New Sci. 1974;62:299-302. Kessler IS, Clark JP. Saccharin, cyclamate and human bladder cancer: no evidence of an association, JAMA 1978;240:349-55. Cal/EPA, Evidence on the Carcinogenicity of Sodium Saccharin: Final. (Reconsideration). California Environmental Protection Agency (Cal/EPA), Office of Environmental Health Hazard Assessment (OEHHA), Reproductive and Cancer Hazard Assessment Section, Sacramento. Avaiable from: http://oehha.ca.gov/prop65/hazard_ident/pdf_ zip/SodiumSaccharin_FinalHID.pdf 2003. Roberts A. The safety and regulatory process for low calorie sweeteners in the United States. Physiol Behav. 2016. Sylvetsky A, Rother KI, Brown R. Artificial sweetener use among children: epidemiology, recommendations, metabolic outcomes, and future directions. Pediatr Clin N Am. 2011;58(6):1467-80. US Food and Drug Administration. Guidance for industry: frequently asked questions about GRAS. Center for Food Safety and Applied Nutrition.2004. Mattes RD, Popkin BM. Nonnutritive sweetener consumption in humans: effects on appetite and food intake and their putative mechanisms.Am J Clin Nutr. 2009;89(1):1-14. Johnson RK, Appel LJ, Brands M, et al. Dietary sugars intake and cardiovascular health: a scientific statement from the American Heart Association. Circulation. 2009;120:1011-20. Fernstrom JD. Non-nutritive sweeteners and obesity. Annu Rev Food Sci Technol. 2014;6:119-36. Swithers SE. Artificial sweeteners produce the counterintuitive effect of inducing metabolic derangements. Trends Endocrinol Metab. 2013;24:431-41. Renwick AG, Molinary SV. Sweet-taste receptors, low-energy sweeteners, glucose absorption and insulin release. Br J Nutr. 2010;104:1415-20. Hackett M, Bland A, XMa K. Yokose, Chemical Economics Handbook Report: High-Intensity Sweeteners. 2014. United States Department of Agriculture, Sugar and Sweeteners. Outlook. 2012. Sclafani A. Sweet taste signaling in the gut. Proc Natl Acad SciUSA. 2007;104(38):14887-8. Swithers SE, Martin AA, Davidson TL. High-intensity sweeteners and energy balance. PhysiolBehav. 2010;100(1):55-62. Appleton KM, Blundell JE. Habitual high and low consumers of artificially-sweetened beverages: effects of sweet taste and energy on short-term appetite. PhysiolBehav. 2007;92(3):479-86. Suez J, Korem T, Zeevi D, et al. Artificial sweeteners induce glucose intolerance by altering the gut microbiota. Nature 2014;514:181-86. Saris WH. Sugars, energy metabolism, and bodyweight control. Am J Clin Nutr. 2003;78:850S-857S. Griffioen-Roose S, Smeets PAM, Weijzen PLG, et al. Effect of replacing sugar with non-caloric sweeteners in beverages on the reward value after repeated exposure. PLoS One. 2013;8(11):e81924. Green E, Murphy C. Altered processing of sweet taste in the brain of diet soda drinkers. Physiol Behav. 2012;107(4):560-67. Depoortere I. Taste Receptors of the Gut: Emerging Roles in Health and Disease. Gut. 2014;63:179-90. Kokrashvili Z, Yee KK, Ilegems E, et al. Endocrine taste cells. Br J Nutr. 2014;111:S23-S29. Jang HJ, Kokrashvili Z, Theodorakis MJ, et al. Gutexpressed gustducin and taste receptors regulate secretion of glucagon-like peptide-1. ProcNatlAcadSciUSA. 2007;104(38):15069-074. Palmnäs MSA, Cowan TE, Bomhof MR, et al. Low-dose aspartame consumption differentially affects gut microbiota-host metabolic interactions in the diet-induced obese rat. PLoS One. 2014;9(10):e109841. Miller PE, Perez V. Low-calorie sweeteners and body weight and composition: a meta-analysis of randomized controlled trials and prospective cohort studies. Am J Clin Nutr. 2014;100:765-77. Thomas JG, Bond DS, Phelan S, et al. Weight-loss maintenance for 10 years in the National Weight Control Registry. Am J Prev Med. 2014;46:17-23. Phelan S, Lang W, Jordan D, et al. Use of artificial sweeteners and fat-modified foods in weight loss maintainers and always-normal weight individuals. Int J Obes (Lond). 2009;33:1183-90. Catenacci VA, Pan Z, Thomas JG, et al. Low/No Calorie Sweetened Beverage Consumption in the National Weight Control Registry.Obesity. 2014;22(10):2244-51. Bar A, Biermann C. Intake of intense sweeteners in Germany. ZErnahrungswiss. 1992;31(1):25-39. Sylvetsky AC, Welsh JA, Brown RJ, et al. Low-calorie sweetener consumption is increasing in the United States. Am J Clin Nutr. 2012;96(3):640-6. French S, Rosenberg M, Wood L, Maitland C, Shilton T, Pratt IS,et al. Soft drink consumption patterns among Western Australians. J Nutr Educ Behav. 2013;45(6):525-32. Durán Agúero S, Blanco Batten E, Rodríguez Noel Mdel P, Cordón Arrivillaga K, Salazar de Ariza J, Record Cornwall J, et al. Association between non-nutritive sweeteners and obesity risk among university students in Latin America. RevMed Chil. 2015;143(3):367-73. Durán Agüero S, Record Cornwall J, Encina Vega C, Salazar de Ariza J, Cordón Arrivillaga K, Cereceda Bujaico Mdel P, et al. Consumption of carbonated beverages with nonnutritive sweeteners in Latin American university students.NutrHosp. 2014;31(2):959-65. Stern D, Piernas C, Barquera S, et al. Caloric beverages were major sources of energy among children and adults in Mexico 1999-2012. J Nutr. 2014;144(6):949-56. Weihrauch MR, Diehl V. Artificial sweeteners–do they bear a carcinogenic risk? AnnOncol. 2004;15:1460-65. Andreatta MM, Munoz SE, Lantieri MJ, et al. Artificial sweetener consumption and urinary tract tumors in Cordoba, Argentina. PrevMed. 2008;47(1):136-9. Hoover RN, Strasser PH. Artificial sweeteners and human bladder cancer. Preliminary results. Lancet 1980;1:837-40. Capen CC, Dybing E, Rice JM, et al. Species differences in thyroid, kidney and urinary bladder carcinogenesis. IARC SciPubl.1999;147:1-225. Magnuson BA, Burdock GA, Doull J, et al. Aspartame: a safety evaluation based on current use levels, regulations, and toxicological and epidemiological studies. Crit Rev Toxicol. 2007;37:629-727. Soffritti M, Belpoggi F, Manservigi M, et al. Aspartame administered in feed, beginning prenatally through life span, induces cancers of the liver and lung in male Swiss mice. Am J Ind Med. 2010;53:1197-1206. EFSA. Opinion of the scientific panel AFC related to new long-term carcinogenicity study on aspartame. EFSA J. 2006;356:1-44.